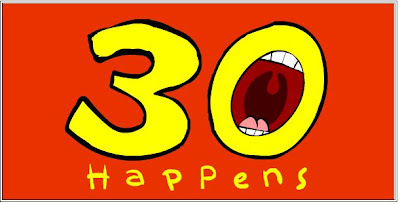 Today is my 30th birthday! It has been a relatively quiet day I suppose. I took the day off to get some rest after everything that has been happening. After I have done so much for others this past week I thought I deserved a little attention too. My mom-in-law came over and baked a cherry pie (yummmm!) with the kids for our dessert tonight and decorated a bit. She even took the kids for a little while and I enjoyed a nice conversation with an old friend (not old in age of course, just friendship years). I have picked up the house, did some laundry, and some dishes, but also got in a nap and am now taking some time to enjoy the blogosphere. Tonight Dave and his parents are taking me out to dinner here and I can't wait. I was checking out their menu calamari, crab dip, clam chowder...choices, choices! Don't you worry though because I will be sure to tell you what I decided! Tomorrow I am going to head back to my parents house for a couple of days. They are having a community yard sale so I'm going to take what didn't sell at mine a few weeks ago and try to get rid of some more. I figure what doesn't sell there I will just leave for their garbage! It never hurts to try to earn a bit more money though, huh?! Not to mention they have a pool and since it is supposed to be between 95-100 on Saturday it may be a nice place to relax. HAPPY BIRTHDAY!!!!! I'll be joining you in about 9 months LOL. Thanks so much for the email today..... I can't wait to hear how you like this place. I have been really wanting to try it!! Ah, the 30th birthday. The only one of mine that had me a little bummed. I'm over it now, and can't believe how great my 30s are. Happy day to you! Hope you have a good one! The 30's are not bad...although this was my first year! But still...not bad...don't sweat it. P.S. My fruit roll ups arrived today - how fast was that??? I will let the kids open the box after school. Happy Birthday Mel! It sounds like you had a great day! oohhh - Happy Birthday! I turn 40 this year. Not looking forward to that one. Hope it went well. Go ahead...tell me like it is! Welcome to my little slice of the web! I'm happy you came. "Life is like a box of chocolates...you never know what you're going to get". Enjoying all life has to offer as a wife, mom, teacher, and everything else. Contact me at melsboxofchocolates AT gmail DOT com.